At a gymnasium in Waynesburg, Pennsylvania, Trenton Phillips is looking for a job as a coal miner. Phillips already works at a company that fixes belt lines at coal mines. He’s at a job fair in Greene County today. He passes booths for health care and trucking jobs. He stops only at a booth for a coal mine contractor. He wants to become a mine foreman or supervisor. “I’m currently looking for something where I can advance. Maybe one day be somewhere higher up, not have to break my back and use my head a little more,” says Phillips. Phillips, 24, got a job at a union coal mine after graduating high school six years ago, during better times for the coal industry. With overtime, he says he made up to $90,000 a year. “It was pretty much boomin’ when I was coming right out of high school so that seemed like the thing to do,” said Phillips. The mine closed in 2015. So Phillips drove a truck in the oil and gas industry for a year. But the hours were unpredictable. So, when a job opened up at the belt repair company, he grabbed it. He says he’s not afraid of another coal industry slump, now that President Trump is in the White House. Trump has begun rolling back regulations on coal mine waste and its carbon pollution. Trump has promised to revive the coal industry, and coal miners are taking this promise to heart, sticking with an industry that has been walloped in recent years. “Now everything seems to be going back up and it’s going in the right direction,” he said. Coal mining jobs plummeted beginning around 2012, and have slightly rebounded since the middle of 2016. Source: U.S. Bureau of Labor Statistics. Coal mining jobs plummeted beginning around 2012, and have slightly rebounded since the middle of 2016. The coal industry has rebounded…a bit. This has more to do with foreign demand and rising natural gas prices than any of President Trump’s pro-coal policies, said Dan Klein of S&P Global Platts, a company that analyzes energy trends. “There’s been very little measurable impact of what the administration has done and to be honest, there’s very little that could be done,” Klein said. That’s because low natural gas prices should continue to keep the market for coal weak. Coal production is up this year, by about 8 percent, but it’s still not close to the level it was at when Phillips first started working in the industry in 2011. The number of U.S. coal miners fell from 90,000 in 2012 to 50,000 in 2016, but the industry has added around 2,000 jobs so far this year, according to Bureau of Labor Statistics. And the Department of Energy says coal demand will remain more or less flat the next couple of years. But — at least in Pennsylvania — there are plenty of coal miners who are optimistic that coal is coming back, says Ami Gatts, director of Pennsylvania’s Southwest Corner Workforce Development Board. Her agency got federal funding to re-train 750 laid-off miners, but only 220 have signed up. One reason why so few applied, Gatts says, is that miners can’t afford to go back to trade school without drawing a paycheck. But the idea of a coal rebound is also a factor, she says. Not all in the coalfields think the industry will come back. Elton Reha comes from a family of coal miners, but he isn’t looking to go back underground. 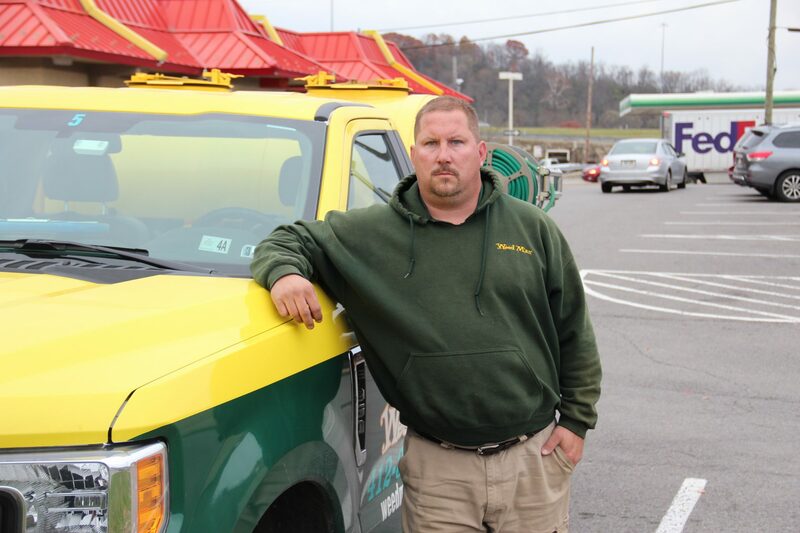 At a McDonald’s near Pittsburgh, Reha took a lunch break from his job with a national lawn care company, where he’s a lead technician on a small crew. Reha is 41, and is a father of two. He earns around $40,000 a year, close to what he made working as a contractor in coal mines. He left the coal industry five years ago, when he suffered a bad hernia pulling on a heavy chain. Since then, the coal industry has slumped–big time. “I’ve watched three of my family members lose their job with the coal mines…and the coal companies they work for say, ‘Oh we’ll get you back. We’ll get you back. We’ll get you back,’” Reha said. But they never did get their jobs back. Reha says coal mining has done a lot of good.